Up at 4:45 AM today rarin' to go to Logan Pass and maybe drive The Going To The Sun Road over to Lake McDonald and back. But this morning's weather set us back on our haunches. Heavy duty storm clouds filling the canyon and shrouding the Precambrian Mountain peaks. So now it's getting on toward 6:30 AM and we're kinda wondering what to do. We'll probably mosey on out of here and head up toward the pass along about 7 AM. The Logan Pass Parking lot has been filling tighter than a sardine can by 8:30 AM every morning for what seems like forever. 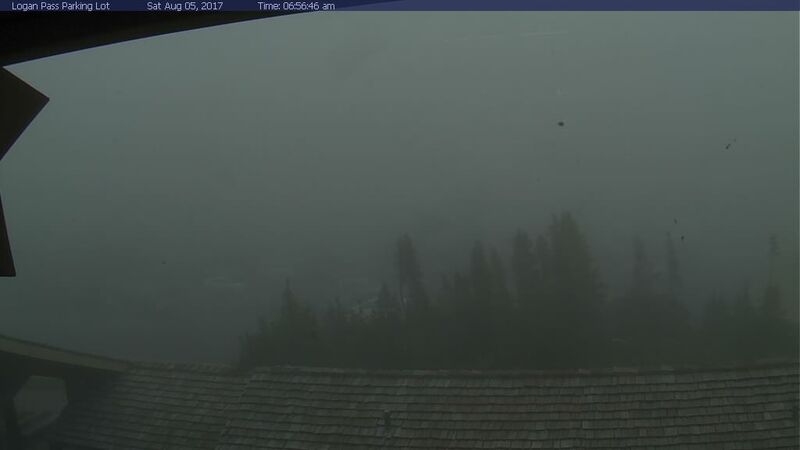 The NPS even put in a web cam up there so show people proof that it's plumb packed full. There is a large flashing sign before the East Entrance shouting in caps that LOGAN PASS PARKING LOT FULL. Nobody apparently pays any attention to either the web cam or the shouting sign and they all head up that way and create the usual chaotic congestion. I guess we're no exception. Anyway, as you know, we will find something to do with ourselves today, even if it involves marathon napping. There are a couple of trails up yonder that should be good to go even if we can't see anything. Walking in a fog is actually kinda fun. Heck, some people think we've been walking in a fog our whole lives. But we digress. We've learned more than a few lessons on this Road Trip, including an important one yesterday. Yesterday's lesson was/is about Many Glacier Campground. As you may recall, we spent the past 3 years trying to get reservations in the Many Glacier Campground. Each year we've failed miserably. This year we changed horses and decided to book into Saint Mary. Lo and behold, Saint Mary Campground is FAR superior to Many Glacier Campground. We're talking FAR, FAR superior, not just a little bit superior. So, why were we so fixated on Many Glacier? Somehow, we presumed the views from the campground would look like the postcards you see of that amazing place. Wrong. There are virtually no views from the campground. It's a tight, crowded, congested campground in dire need of some maintenance. The road into Many Glacier was tough on our truck and would have really beat up our trailer. Meanwhile, you're really in the middle of nowhere out there at the end of that dead end road. Many Glacier is a super nice place to visit but we really wouldn't want to stay there. And, not only that but the campground sits right smack dab in the middle of the mind-boggling day uses congested areas. What a zoo scene it was there yesterday. And how disappointed we would have been to go there and be stuck in that mess. Saint Mary Campground, by comparison, is a delightful place and has all the amenities we want and need, including 4 bars of cell signal which make it possible to post the stuff you're reading right now. Cell signal in Many Glacier? Fuggetaboutit. So, that's my lesson learned yesterday. Don't be so stuck on one objective that we fail to properly consider other alternatives. It might just be that the other alternative(s) are far superior to the desired objective. Well, it's 6:30 AM now and time to get semi-serious about moving out into the Glacier Whirled to experience a New Day in a New Way. Happy Saturday & Many Cheers! Below is Logan Pass at 7 AM. I'm happy to hear you actually had cell service at all. The Park Service seems 100% against having cell service. Their employees complained to me about it last year in September when I was there. I had no bars until I got to the town of Glacier. Glacier, sadly, needs to implement something akin to Zion and reduce traffic. The Going to the Sun road is a gorgeous drive but very packed. And there is always someone who doesn't believe them when they say your vehicle with mirrors can't be wider than such and such a width. I saw folks having to wait behind oversized pickups and too large of motorhomes who couldn't fit in between the center lane and the rock walls in at least three locations. My Ford Campervan barely fits and it's small compared to most. Glad you like the campground. 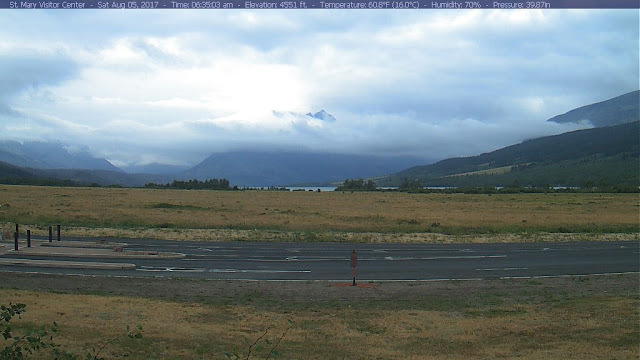 I also did that long drive into the bone rattling campsite in September and left, even though they had some cancelled reservations due to the fact that it rained most of September in Glacier. The campgrounds are in dire need of repair and are so very dated. It's a really cool park but I never saw a mountain goat the entire time I was there despite doing three long hikes. Love the photos from the Lake and Lodge. You had a similar day to mine last September with sun and great light.